Solid wood occasional furniture for your bedroom. Your bed is in the best company. 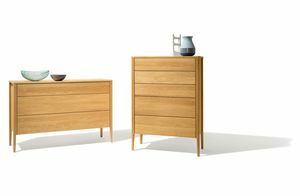 TEAM 7’s bedside tables and dressers are perfectly matched to the relevant bed model. Standard and large sizes or inside drawers are available to provide the storage space you need. Fronts and top boards in various types of wood and glass in the colour of your choice* provide plenty of scope for individual designs.